Tomb Raider: Definitive Edition lords it over in the UK sales charts, with the PS4 version moving more than twice its Xbox One counterpart. 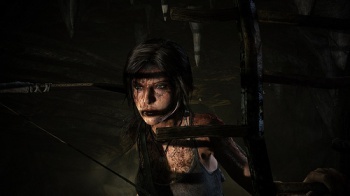 Lara's next-gen debut, Tomb Raider: Definitive Edition, proves to be a big win for Square Enix, as the action-adventure game managed to knock FIFA 14 off its throne. Interestingly enough, the PlayStation 4 version of Tomb Raider has managed to sell more than double compared to the Xbox One version. According to Chart-Track, 69% of total Tomb Raider: Definitive Edition units were sold on the PS4, while the Xbox One version settled with just 31%. Even if Lara managed to knock EA's FIFA 14 off the top spot, the soccer-sim was behind by less than 500 units. The entire top ten is listed below. It's been reported before that the PS4 version of Tomb Raider was the technically superior version. Is this the case why it sold over twice as much than its Xbox One counterpart, or is it because there are more people who bought the PS4 in the UK compared to Microsoft's console? Regarding the Xbox One, resolutions and frame-rates, over the weekend, a Microsoft exec told a gamer to troll less and game more when needled about the Xbox One's apparent technical limitations of the console when it comes to these issues.